After a tough session with Rama on Sunday morning, my parents and I went out for lunch. We went to a place called Gypsy Chinese at the Dhow Palace Hotel in Bur Dubai. Dad had been to another restaurant in the hotel the day before and wanted to try this Bombay Chinese place. It’s a small restaurant, and there was only one other table occupied that afternoon. We looked through the menu and I started ordering – soup, spring rolls and dynamite chicken for starters. And then I started ordering the main course. ‘Could we have the sizzling lamb in black bean sauce?’ I began. ‘And some crispy noodles…’ The Indian waiter interrupted and asked what we were going to eat the lamb with? Well, rice obviously, I thought to myself. ‘Why don’t you try the other lamb?’ Because I want the one I’ve bloody ordered. He was starting to irritate me. We eventually ordered the lamb he suggested and rice. We had wanted noodles but decided to see if we were still hungry after the lamb (we weren’t – and even if we were I’m not sure we’d have been allowed to order anything!). The food was good but I don’t think I’d go back in a rush. After lunch we wandered around Burjuman for a while and had a coffee at Gloria Jean’s. We decided we’d go to a movie that evening and settled on ‘The Bourne Legacy’ at Mercato. I had no idea what was going on in the first 20 minutes but it eventually all came together. I actually only went for the popcorn, and although my mum and I both ordered the small size, mine was much smaller than hers! I had yoga on Monday morning and then went to Dreamworks Spa for a massage. I’d bought a voucher before my holiday and it was expiring soon. I worked for the rest of the afternoon and evening – I still had a lot to catch up on from the last couple of weeks in Bali, but I was getting there slowly. On Tuesday I went to the gym and worked all day. On Wednesday I had another session with Rama and then went to Baker & Spice at Souk Al Bahar with some friends. I hadn’t been there yet – and was pleasantly surprised. We shared some salads to start with, and then shared some roast chicken, red snapper, gnocchi and pasta with prawns (which I didn’t have). For dessert we had the best carrot cake I’ve ever eaten. It was out of this world. I worked all afternoon – my parents went out to a movie – and then I joined them for dinner at PF Chang at the Dubai Mall. All I wanted was soup and the steamed salmon, but as usual ended up over-eating. I ended up staying home all of Thursday too (apart from the gym). I’d been in work mode most of the week and just wanted to get things done. On Friday I went to a friend’s birthday brunch at the Grand Grill at the Habtoor Grand. It was a fun afternoon – the food was good and the booze was flowing. That night I met up with a friend at Vintage in Wafi – they still had their two-for-one offer on bottles of wine and we were there for quite a while. I felt awful on Saturday. I hadn’t slept well the night before and had a headache. I lazed around at home for most of the day and in the evening went to the mall with my parents. My phone needed sorting out at Du, we went for coffee, and then had dinner at Lafayette Gourmet. We like going there because it means we don’t have to agree on what cuisine we want – Dad had Thai curry, Mum had a Caesar’s salad, and I had hot and sour soup and sushi. Perfect. 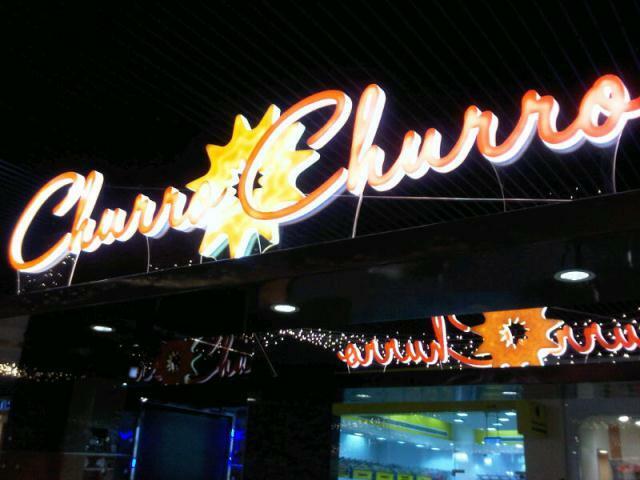 On our way out we noticed there was a new churros place that had opened. Oh good. Just what the mall needs… more deep-fried crap. Of course we bought some. We were home by 10pm and I finished watching Season 5 of ‘Mad Men’.